France is located in Western Europe (bordering the Bay of Biscay, English Channel and Mediterranean Sea). 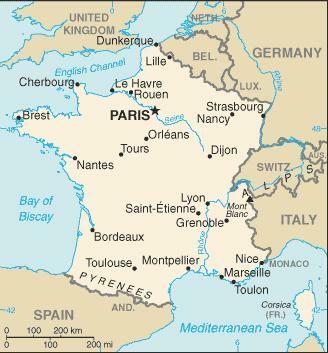 France shares borders with Italy, Switzerland, Germany, Luxembourg and Belgium on the west and with Spain on the southern-east. France is divided into 22 metropolitan regions and 4 overseas regions. The country is subdivided into 96 metropolitan departments and 4 overseas departments. France is a republic. The President is the chief of state and is elected every five years. Bicameral Parliament consists of Senate and National Assembly. Members of the Parliament are elected every five years.